Understanding Words in Context (P. Tabossi). Contextual Constraint and Lexical Processing (P.J. Schwanenflugel). Contextual Feature Activation and Meaning Access (G. Kellas, S.T. Paul, M. Martin and G.B. Simpson). A Perspective on Sentence Context Research (P.G. O'Seaghdha). The Role of Suppression in Sentence Comprehension (M.A. Gernsbacher and M. Faust). Electrophysiological Evidence for the Flexibility of Lexical Processing (C. Van Petten and M. Kutas). Comprehension Processes in Reading Ambiguous Sentences: Reflections from Eye Movements (K. Rayner and R.K. Morris). The Role of Knowledge in Comprehension: A Cognitive Control Perspective (P. Whitney and D.A. Waring). Understanding Idiomatic Expressions: The Contribution of Word Meanings (C. Cacciari and S. Glucksberg). On the Combinatorial Semantics of Noun Pairs: Minor and Major Adjustments to Meaning (E.J. Wisniewski and D. Gentner). Making Sentences Make Sense, or Words to That Effect (G.C. Oden, J.G. Rueckl and T. Sanocki). How is Verb Information Used During Syntactic Parsing? (F. Ferreira and J.M. Henderson). The Role of Lexical Representations in Sentence Processing (J.E. Boland and M.K. Tanenhaus). The Resolution of Indeterminacy During Language Comprehension: Perspectives on Modularity in Lexical, Structural and Pragmatic Processing (D.A. Swinney). Author Index. Subject Index. Research concerning structure and processing in the mental lexicon has achieved central prominence within cognitive psychology and psycholinguistics. Historically, however, much of the research on the lexicon focussed not on its role in language comprehension, but as a medium for studying semantic memory. This picture has changed in recent years, with much more research examining the role of lexical processes and output in language comprehension. Gathered together in this volume is the work of some of those researchers who are responsible for this shift of emphasis. 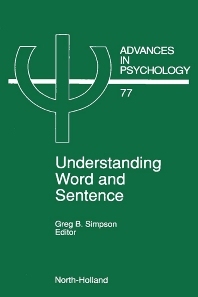 Chapters deal with the role of sentence contexts in word recognition, processes involved in the activation and enhancement of lexical information, and the interaction of lexical and syntactic information in sentence processing. A wide range of theoretical and empirical issues relating to language understanding are discussed.